Birds can make for wonderful companions and pets, but even more remarkable is how birds can soar through the air, make music, or fly away. References to birds have been found in virtually every art form: theater, paintings, literature, and especially music. Take a look at some modern-era songs about birds. Some are silly, some are serious, but they each reveal a little bit about how we relate the qualities of birds to ourselves and our daily lives. This happy, upbeat tune tells the tale of three birds who helped remind Bob Marley that "every little thing is gonna be all right." This famous reggae song was inspired, according to Marley biographers, by flamingos that he used to see outside his window. 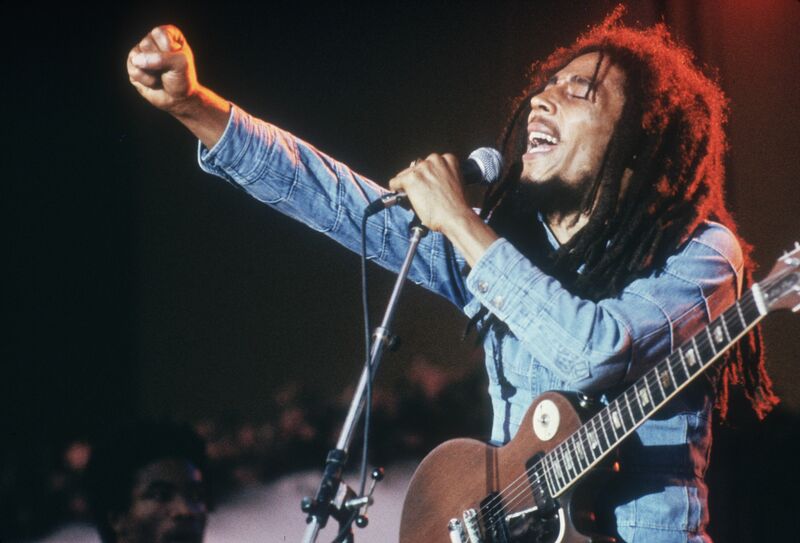 Marley sang, "Rise up this mornin'. Smiled with the risin' sun. Three little birds, pitch by my doorstep. Singin' sweet songs of melodies pure and true. Saying', this is my message to you." Singer songwriter Paul McCartney, 1969. Throughout much western folklore and literature, blackbirds have symbolized freedom and mystery, and often represent a link between the conscious and unconscious in some Eastern cultures. Songwriter Paul McCartney has said the blackbird in the song symbolizes the racial tensions and struggles of African-Americans in the American south in 1968, the year the song was released. The lyrics include: "Blackbird singing in the dead of night. Take these broken wings and learn to fly. All your life. You were only waiting for this moment to arise." Reminding us all that "bird is the word," this silly but fun song combines the original "Surfin Bird" with lyrics from another song of the same time period, "Papa Oom Mow Mow." Just a warning before you Google this one: Although its lyrics are not terribly nuanced or profound, "A-well-a everybody's heard about the bird bird bird bird. B-bird's the word oh well-a bird bird bird," this is most assuredly a song that will become stuck in your head. L-R: Allen Collins, Gary Rossington of Lynyrd Skynyrd. Birds are often seen as symbolic of freedom and independence, and the southern rock classic "Free Bird" uses this association as its main theme. Full of musical highs and lows, the song expresses the view that much like wild birds, some people can never be changed. The song and the band have a somewhat troubling history; until 2012, Lynyrd Skynyrd used to display a Confederate flag at its shows. It is a controversial symbol in the United States, due to the flag's longstanding associations with racism, slavery, segregation, white supremacy, and treason. In this 1992 song, Annie Lennox sings about her wish to be a bird and "fly away from here." It's not really a song about a bird as much as it's about wanting to escape a negative situation. For example, these lyrics impart the sentiment: "I am just a troubled soul who's weighted to the ground. Give me the strength to lay this burden down." A memorable scene involving this song In 1996 comes from the movie Striptease when Actress Demi Moore dances suggestively along to it. This familiar oldie but goodie has been a favorite of all ages since its release in 1958. One of its most famous and best-loved cover versions was recorded by Michael Jackson and the Jackson Five in 1972. 14-year-old Michael had a voice well-suited for the energetic song: "He rocks in the treetops all day long. Hoppin' and a-boppin' and singing his song. All the little birdies on Jaybird Street love to hear the robin go tweet, tweet, tweet." Jerry Garcia (left) and Bob Weir of The Grateful Dead, 1972. This plaintive tune makes reference to the beauty of a bird's song and has a tragic inspiration behind it. Band members Jerry Garcia and Robert Hunter wrote the 1971 song as a tribute to singer Janis Joplin, who died of a drug overdose in 1970. The lyrics referencing Joplin: "All I know is something like a bird within her sang. All I know she sang a little while and then flew on."